The pilgrimage of spirituality, devotion and sanctity ‘Kumbh’ is the largest gathering on earth with millions of devotees coming together to participate in the world of knowledge and eternity. The grandeur event of ‘power of faith’, Prayagraj Ardh Kumbh Mela 2019 is going to be held at Triveni Sangam in Prayagraj from January 15 to March 4. The Kumb celebration will witness millions of devotees taking holy bath in sacred rivers in order to indulge in heavenly realm leading to ultimate salvation. 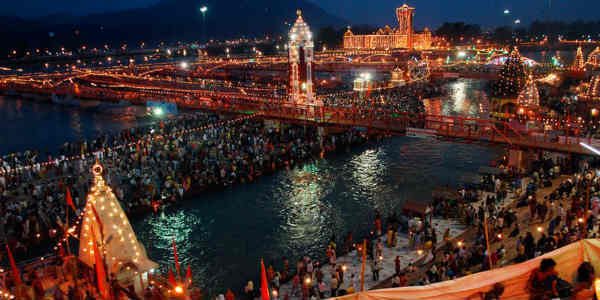 According to mythological times, when demigods and demons were fighting a waging war for possession of elixir for immortal life, a few mystical drops had fallen to mainly four places where now Kumbh Mela is celebrated I.e Prayag, Haridwar, Ujjain and Nashik. Depending on movement of different planets, the venue for Kumbh is decided. The Hindu month of Magha I.e period ranging between January and February marks the presence of Kumbh Mela in Prayagraj when Jupiter is in Aries or Taurus as well as Sun and Moon in Capricorn. This year Kumbh Mela in Prayagraj will observe devotees from worldwide and to keep situation under control, a special security care unit has been appointed to look after emergency services, traffic plans, medical facilities and disaster management. By looking at all majestic Vedic Mela tents around, Prayag is all set to celebrate its larger than life event. Now let’s quickly know how weather will treat the celebrations. Generally, the sacred city of Prayag does not have a prolonged winter season. Moreover, winters here are mild, however cold spells still persist. The winter season usually lasts here for two months with winter chill taking over the region for about 30 days. The average minimum in January stays around 9.2℃. Also January is that month, which continuously records single digit minimums. According to data, the lowest single digit minimum that Prayagraj recorded was back in 2013 at 2℃. In 2018, mercury was risen to 5℃. Moreover, being situated alongside of major river bodies which contribute in moisture content and thick fog formation, January is the foggiest month for Prayagraj. This month also marks some winter rains which significantly reduce in February and vanish in March. However, mid February onward, warmth enters the region and minimum averagely shifts to 12.3℃. Situation changes completely in March as hot weather starts making its presence felt over the region with average minimums around 17.1℃. On the other hand, average minimum for the month of January over Prayag is 22.8℃, for February it is 27.1℃ whereas 33.7℃ for March. This year’s Kumbh Mela will witness different milestones and shades of weather between January 15 and March 4. Winters will remain at its peak in January and devotees will take the holy dips with chilliness in weather all around. These conditions will change in first ten days of February. Till second half of February, devotees will get the touch of warmth and by end of February hot weather will completely take over the region. 1. January 15- ‘Makar Sankrant’ : Beginning of Ardh Kumbh Mela with first ‘Shahi Snan’. Day will be chilly cold and foggy conditions will appear. 2. January 21- ‘Paush Purnima’ (Full moon day) : Winter chill will persist and there is possibility of some rains. 3. February 4- ‘Mauni Amavasya’ (New moon day) : The day of second ‘Shahi Snan’. Winter chill will make an exit. However, cold weather conditions will persist. 4. February 10- ‘Basant Panchami’ : The day of third ‘Shahi Snan’. Weather conditions will turn pleasant with touch of warm to be felt during afternoon hours. 5. February 19- ‘Maghi Purnima’ : Warmth will tighten its grip over the region. Day will heat up, however nights will remain cool and pleasant. 6. March 4- ‘Mahashivratri’ : End of Ardh Kumbh Mela. Day will become fairly warm inclining towards hot weather conditions. By looking at above predictions, now let’s hope the weather stays at its peace to make this event larger than life celebration to get indulged in the world where all sorrows and pains are oblivious.